I was introduced to GreaterSkies earlier this year and I haven’t stopped looking at my beautiful print since. The quality is stunning and to be able to have a snapshot of the stars over a particular place and time is a great gift idea. 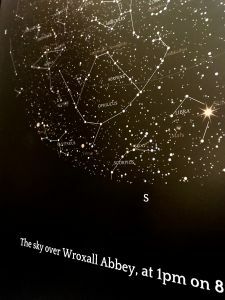 I chose the sky as it would have appeared when Jacob and I got married, but there were so many other dates that sprung to mind too. 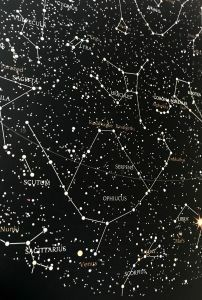 Perfect for those who like to capture their memories, once selected your star map is immediately available as a download. As well as the beautiful GreaterSkies print you could have your chosen image transferred on to a number of products. This really would make a great gift to give. Since my last post, GreaterSkies have added a number of new print options to their catalogue which would make a fabulous addition to any wall. I chose the Night Sky option and it hangs above my desk and is perfect for gazing at when I’m drawing breath and refocusing my creativity. My husband enjoys looking at it too when he’s working from home, so much so that when I set up my new work station in my garden office I think I might need to get another! The team at GreaterSkies are fantastic and customer service is exceptionally good. I would have no hesitation in recommending them as a fabulous gift option at any time of the year. N.B. I was gifted a GreaterSkies print earlier this year in exchange for my honest opinion. All thoughts are my own. For more information please visit my disclosure page.